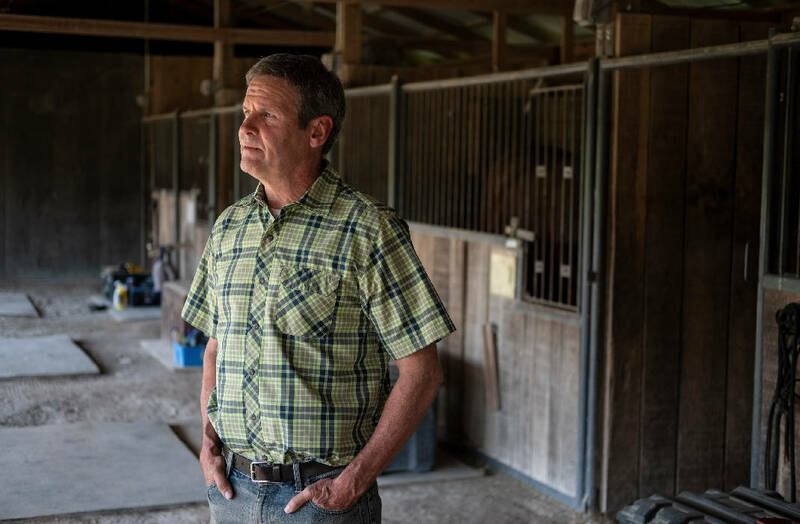 Republican candidate for governor Bill Lee poses for a portrait near horse boarding stables at his family farm on Saturday, May 12, 2018, in Franklin, Tenn.
Editor's note: This is the eighth and final story in a series profiling the major candidates for Tennessee's U.S. Senate and governor seats. Visit timesfreepress.com/politics to read previous profiles. FRANKLIN, TENN. — Bill Lee drove over a bridge, toward his property. He saw his 9-year-old son fly fishing. He turned onto a dirt road. He saw his other son in the barn, grooming calves. He moved down the driveway. He saw his wife and 4-year-old daughter, crossing a creek on horseback. He honked and waved. "Who lives like this?" he thought to himself. This, meaning life on a 1,000-acre Hereford cattle farm, where Lee had lived since he was a child. Like him, his four siblings had homes on the property. So did his mother and father. Lee was president of the family business, an HVAC, plumbing, electrical and home security company. He had grown it since taking over, hired more employees, expanded to other states. Parents at his children's private Christian school spoke glowingly of him. His business was booming, they heard. And he was so nice and humble. He stayed involved in school activities. They gave him the highest compliment they could, his boys' former teacher recalled: He was a godly man. When he arrived home, Lee drove to the barn to help his son with his calf. The boy inherited the tradition from Lee, training the animal to behave at his command for a blue ribbon at a public competition. But as they worked, Lee heard something outside. He asked his son to be quiet. Up the hill, behind the barn, his daughter screamed. Eighteen years later, with no experience in public office, Lee is running for governor. And if you've seen Lee — at a debate or in a commercial or at your local Republican party's special dinner event — you know what happened on his farm in July 2000. His wife, Carol Ann, was thrown from her horse. Lee found her on the ground, unconscious. She died three days later in a hospital. Lee tells this story to explain why he's now pursuing the state's highest office. But the through line between these two events is not immediately clear. Carol Ann did not die because of broken policy. She was not a poor woman lacking access to quality health care. She was not killed by a deranged school shooter. She did not become sick from substandard public housing. She was on her private property, enjoying the hobby she loved, and the day took a turn for the absolute worst. No larger force was at play, no shameful government incompetence. But in his pursuit for office, Lee says his wife's death takes on a deeper application than any single policy. "It wiped me out," he said. "It was tragic. But because of my faith, it was transformative." These types of stories take on a conquering arc: You experience adversity, it breaks you down, you rise stronger than before. But you don't conquer the death of your spouse. You survive it. You go through pain, paralyzing pain, and you try to keep living. You live through a day. Then you live through another day. And eventually, you've lived through enough days that you can pretend your life is normal again. And eventually, it actually feels normal again. Through all this, your survival doesn't depend on you alone. It depends on the people around you. Here's how Bill Lee survived: His mother and sister helped look after the children. They hired a woman to clean the house. For months, parents at the school cooked dinners for the family. His friends showed up in the morning to pray with him. They got him out of the house, took him to restaurants and ball games. "He couldn't have done it if he didn't have so much support," said his mother, Ann Lee. "That shaped him." Here's how Bill Lee changed: He volunteered more. He took his children on missions trips to Haiti, Kenya, Mexico and Uganda. He mentored a boy one day a week. He mentored an employee recently released from prison one day a week. He served on the boards of the Hope Clinic for Women and the YMCA of Middle Tennessee. "He needed to give back," Ann Lee said. "He started a different lifestyle: more outgoing and caring and helpful. Not that he wasn't that way before, but he wasn't called on to do that. You can go through life and never really know that people are hurting or that they need your help." Bill Lee met Carol Ann at Auburn University, where he studied mechanical engineering. He was not sure if he wanted to join Lee Company, which his grandfather started in the 1940s, but Carol Ann moved to Nashville to work at the Sunday School Board of the Southern Baptist Convention. He followed her. In 1992, his father and uncle named him president of the company when he was 33. He told employees he would run the business so well that they hoped to retire there. He offered benefits to make them happy: a training academy where they could earn certificates and increase their pay, a chaplain on contract for counseling, a grant program for employees with emergency needs. He loved being in charge. Carol Ann, meanwhile, was different from the Lee children, Ann Lee said. She was disorganized, but her distractions were tied to the deep value she placed on relationships. She talked on the phone for hours. When a friend got sick, she drove them to the hospital and made them dinner. She volunteered in her children's classrooms, invited the teacher over for dinner and hosted the school's Pioneer Day on the family property. "She was beautiful," Bill Lee said. When she died, he tried to embrace his grief. He appointed someone else to run the company's day-to-day operations. He saw a counselor. A year later, he traveled to Yellowstone National Park, the same place he and Carol Ann had gone before her death. "I am a deeper, richer, more purposeful man because of the experiences of my life," he said. "Would I do them again? No. Would I trade what they have done for me? Absolutely not." He has since remarried. Maria Lee, his boys' former teacher at Christ Presbyterian Academy, began helping with the children after Carol Ann's death. She took them out for dinners and stayed with them when Bill Lee had a night appointment. Whenever he returned, they talked for hours. A couple of years after Carol Ann's death, he asked Maria out. But two weeks later, he ended the relationship. "He was concerned about the kids and everything that had been turned upside down," she said. "This would be a big change. I think he just got scared." She threw the phone on the couch, devastated. She envisioned a life with him. And yet, she continued to spend time with his children, and he continued to call her, trying to talk to her as they always had. Eventually, she cut it off, no longer interested in just being his emotional support. Four years later, in the fall of 2007, he found her in the hallway of the school. He heard she had been on a missions trip, and he wanted to learn more about it. He followed up with an email, asking her if she was free that Friday. Her friends told her to say no. She went anyway. They got married a year later. "His godliness," she said, when asked why she stuck around. "And his sense of humor that I found out he had. His kindness. His generous heart. All the kind of — I just started getting sucked in." Around the summer of 2015, she said, Bill began considering a run for governor. The idea didn't shock her. In the years after Carol Ann's death, as he and Maria talked late into the night, he said he was intrigued by public office. About a year later, during an RV trip through New England, over a game of Yahtzee and a bottle of Cabernet Sauvignon, Bill said he was leaning toward running. A couple of weeks later, as he read "My Utmost for His Highest," he made his final decision. Maria found him crying. "He was called to run for this position," she said. "I've always been intrigued by leaders and their role and what they do," Bill Lee said. "Civic leaders. Business leaders. Governmental leaders. Education leaders." He attends management conferences for fun. He studies the careers of successful men in charge. One of his favorite books is "When Character was King," a biography of Ronald Reagan. This, he explains, is why he is not interested in the state Legislature or even Congress, more gradual steps in a political career. He likes putting people in a position to succeed more than the ins and outs of legislating. For example, he is for school choice. But he is not sure which specific variety of school choice he would support. He also wants to more fully "engage" the nonprofit and religious communities, though he is not yet clear what exactly that plan looks like. He will encourage businesses to hire reformed convicted offenders, but he doesn't know how he would incentivize those companies — or whether he would even need to. "My skill set and my giftings are in executive leadership," he said. "That's what the governor is. Legislative, those are different skill sets. Congress, that's a different skill set. That's a different style of work, and it's really a different job." He does not have to be a policy wonk to win, said John Geer, a political science professor at Vanderbilt University. On most issues, the candidates in the Republican Primary are almost identical. What the race really comes down to, Geer said, is convincing voters to like you. In short, Geer said, if enough people get to know Lee before the August primary, he can win. "He's likeable," Geer said. "And he's got a strong personal narrative. He could appeal to people." Through March, according to campaign contribution reports, Lee has raised about $2.6 million. In addition to a Hendersonville law firm, his biggest donors are the BlueCross BlueShield Tennessee PAC, Lifepoint Health PAC, H.G. Realty PAC and the Association of Builders and Contractors. People with the last name Lee have given his campaign a combined $101,600. Lee also has loaned himself $5.3 million for the race. Jim Sattler, the former CEO of EMJ Corp. in Chattanooga, donated $2,000 to Lee's campaign after a friend put them in touch. He said Lee visited him in his office to share his ideas and explain his background. Sattler was particularly impressed with Lee's advocacy for putting more technical training in public schools. After the meeting, Lee followed up with a letter. Simply, Sattler said, he believes Lee is a good man whom he can trust. "I'm just really interested in him, and I feel strongly about it," he said. "I decided that was a horse I was going to run with."